I have a deep desire to become good at street photography. But I’m such an introvert. The thought that I might photograph someone who would notice and then want to talk with me — it’s a real barrier. I have several compact rangefinder cameras that should be fine street shooters, but every time I think about taking one downtown I end up talking myself out of it. That barrier is shorter at the Indiana State Fair because the crowd is thick and cameras are in many hands. I feel like I can hide in the crowd, and if somebody does notice me they will probably not think anything of it. 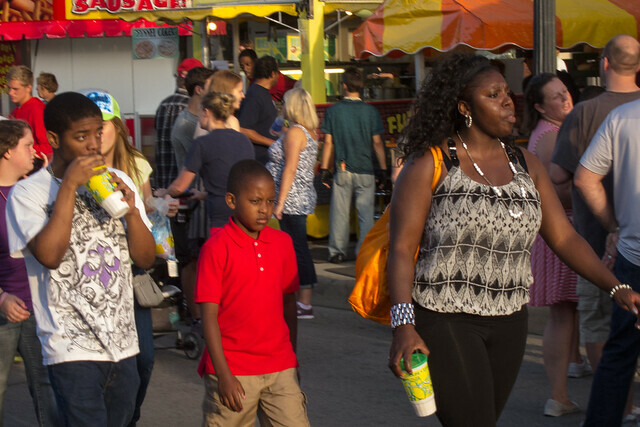 So I spent an evening by myself at the fair last month photographing people. I brought my Nikon F2AS with a 135mm lens even though it’s a mighty conspicuous camera for street work. I am getting to know that lens, and I figured it would let me shoot from a comfortable distance. 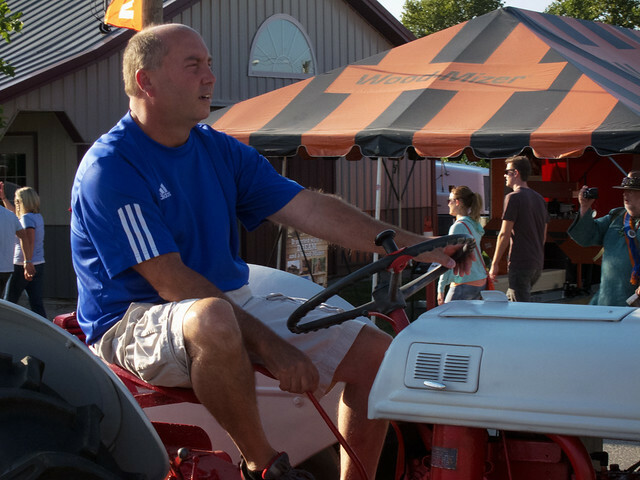 But when I arrived at the fair I discovered that the meter’s battery was dead. D’oh! I didn’t want to fuss with manual exposures, so I reached for my Canon PowerShot S95. I zoomed it to 105mm equivalent for these photos. I shot RAW, something I’m experimenting with lately. I was able to bring out some really good color in my RAW editor. 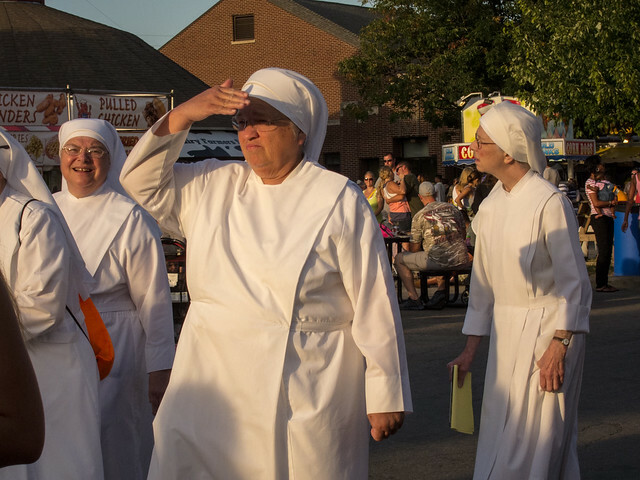 It was delightful to find these nuns enjoying the fair. I’ve never seen all-white habits before, but I’m no nun expert. I just missed getting the cut-off nun at left into the shot. I want to blame shutter lag, which was a factor, but it was mostly because I didn’t get into position fast enough. This family just came from the lemon shake-up stand. The young man in the middle appears not to have wanted one. I watched an oompah band play a few tunes. They were remarkably active and spritely with their big instruments in their hands. I have any number of blurry shots of them. That’s why you’re seeing this shot of their saxophonist in a stationery moment. I really enjoy Pioneer Village, where things are done as they were a century and a half ago. 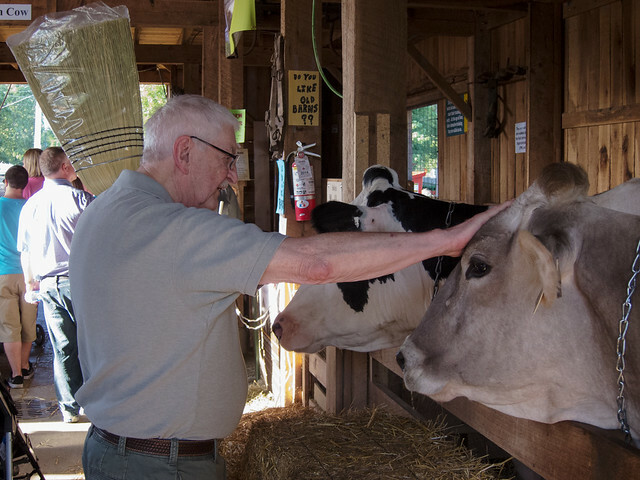 One barn features friendly farm animals you can reach out and touch. This fellow just bought one of the handmade brooms for sale in the next barn over. I arrived in time for the daily parade. 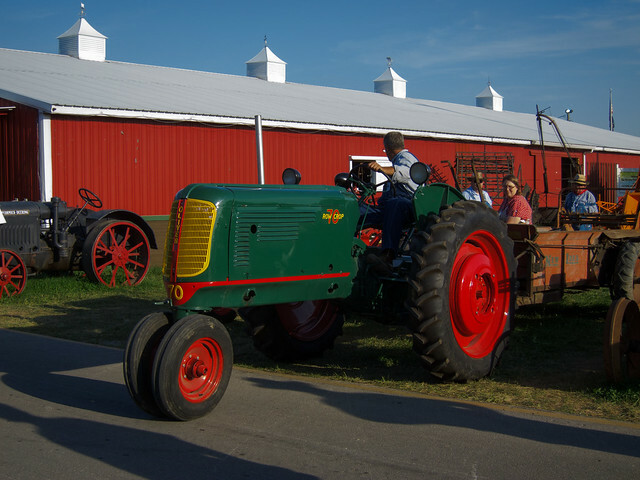 There’s always a cache of antique tractors in the northeast corner of the fairgrounds, and many of them roll in the parade. I think this fellow is driving a 1950s Ford. Those are so nicely styled. 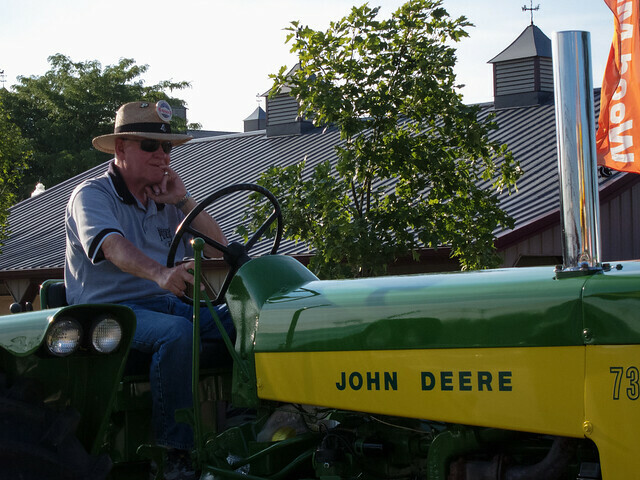 John Deere is always well represented. International usually is too, but I didn’t see one in this day’s parade. The evening sun was on everyone’s back, which made for challenging light. 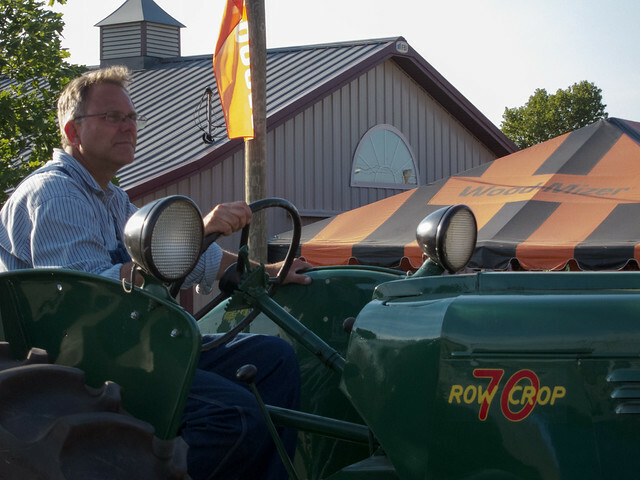 I’m not crazy about this photo’s composition, but given that my dad worked in the Oliver factory for many years, I had to show this fellow driving his Oliver Row Crop 70. 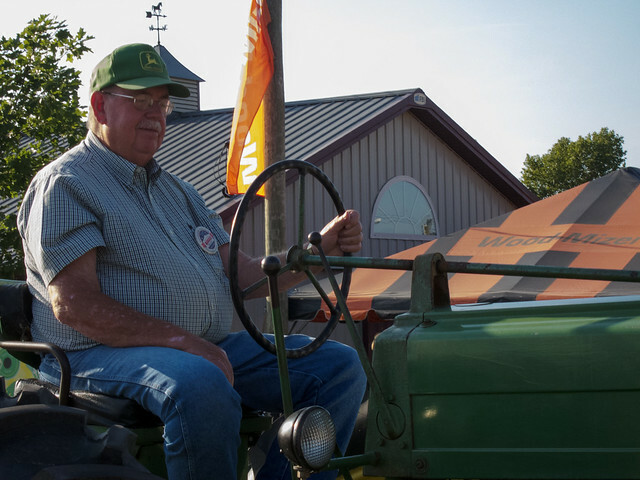 After the parade, I caught the driver backing his tractor into its parking spot. These beautiful streamline-moderne tractors are before my dad’s time in the South Bend Oliver factory; they were first manufactured before he was born. I love how my RAW editing brought out vibrant slide-film colors. 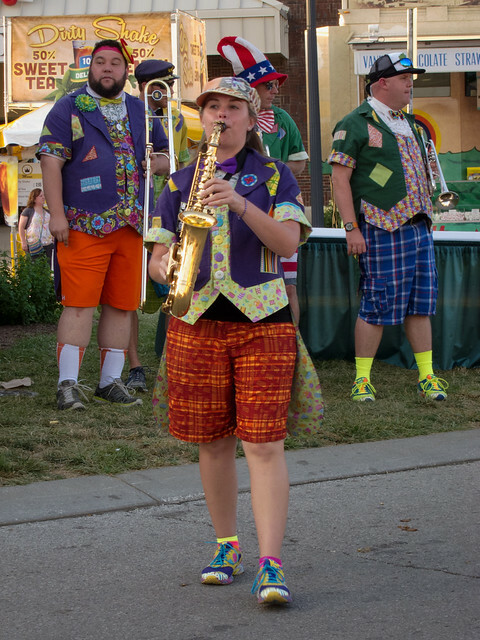 I also got good vibrant color in this last parade photo. These two are riding in the back of a 1950s Dodge Power Wagon. I wish the other fellow had turned his head toward me, too. Every time I try street photography I get a better feel for it. These are by no means prizewinning photos but I can see how I did a little better this time capturing expressions and emotions. I’m enjoying the process of being in the moment, feeling the scene coalesce into a good shot, and pressing the shutter button at that right moment. Now if I can just get over myself and spend some time downtown practicing! This is a good post and seems to indicate a great day out. Well done. Now, get downtown as I’m ready to see what you reveal! Yeah, yeah, I know! One day I will. Funny you should write about this today as I was thinking the same thing yesterday. I tried a little street photography with my Leica as I strolled along the streets of Point Reyes Station, CA. I’ve always had a difficult time feeling comfortable poking my camera in the eye of total strangers on the street. So much easier for me to take a photo of a barn, a tree or the beach. This is a skill that is learned I suppose. In any event, your slice of life shots are nice! That’s the thing about shooting the S95 at 105mm — I can stand back. Maybe what I need to do is break in gradually over a whole bunch of visits, shooting the S95 downtown at 105mm until I feel comfortable being downtown at all with a camera, and then backing off to 50mm so I have to move in closer, and then using one of my small film rangefinders. You made some very nice candid shots with an effective strategy. People at public events expect photographers to be making pictures and generally don’t mind being included whether they are performers or spectators. I often use a 135mm at such events because they provide tighter compositions in situations where getting adequately close with a normal lens would be intrusive. However, unless you are using an autofocus camera the need to constantly refocus can be a distraction. Using a normal 35-50mm lens has several advantages. Perhaps the most important is that getting closer to the subject is nearly always the best choice. Also, if you use a fast film of 400+ with a manual camera you can often set your aperture to f16 and your speed to 1/500 and have sufficient shutter speed and depth of field to capture anything in the frame sharply. I can’t speak about using digital for street work with any authority, but it is pretty clear that the greats of the past did just fine with their manual cameras. Most used the “miniature” 35mm cameras, but many also did good work with the tlr Rollei. Not all of them were bullet-proof extroverts. Cartier-Bresson and Winogrand often bobbed and weaved like prizefighters and sometimes stuck their cameras in peoples’ faces to force a reaction. Others like Vivien Maier got the goods by being more discreet. Hip shooting is a useful technique on the street. You let the camera hang from you neck on the strap and shoot from that position without raising the camera to your face. It takes a little practice to perfect your aim, and it helps to use a camera with a quiet shutter. People often want to turn this technique into some kind of moral issue, but to me it seems primarily a question of efficacy if your objective is candid captures. 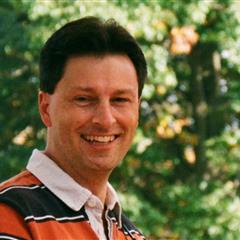 Thanks so much, Mike, for the tips. I can see how Sunny 16 could really help me shoot on the street with an old rangefinder — I think you’re right, the goal is to have big depth of field to eliminate focusing. Truthfully, I feel like shooting digital like this is like using a crutch, as it does so much thinking for me. But I’m fine with a crutch as I wear away at my internal barriers to this kind of photography. As I get more comfortable shooting strangers, I should be able to take steps toward ultimately using one of my film rangefinders, as I outlined in a comment above. I’m an introvert, too, and understand that “clammed-up” feeling one gets in public. You have talent, the right camera, and the desire to be a good street photographer, so please kick those “demons” in your head to the curb and go for it! Life is going by too quickly, and I don’t want you to have the “woulda, coulda” feeling about your street photography someday in the future. These are great shots, full of life and color – keep it up! Yeah, I’d like to avoid the woulda-couldas too. Now to find some time to go downtown! One of the problems with street photography these days is that it is often hard to find people in the street. Especially in the kind of numbers where people stop being so conscious of each other. I have always found it difficult to get natural photos of people when they were aware of being photographed. Even if they don’t mind having their picture taken it seems that there is a stiffening in most people when they know that a camera is on them. 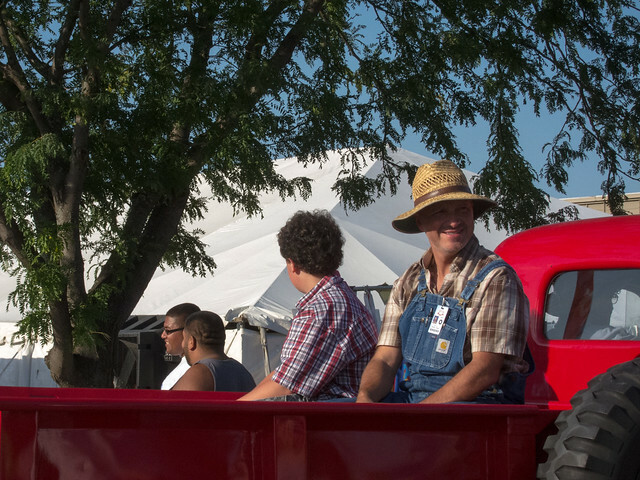 So I think an event like a Fair is one of the best places to do street photography. I also like things like flea markets. Especially since I have other reasons to be there. My main funny feeling about street photography is feeling that I am intruding on someones privacy. The circle in downtown Indy is full enough of people at certain times of day that it would be a viable place to shoot street. The place can be very busy at lunchtime, for example. At least it was 18 years ago when I worked downtown. I have to assume it’s the same today. Of course, I work in Zionsville now, kind of a prohibitive drive for lunchtime downtown shooting. You have a good point about events being probably the best place to photograph this way, though. A flea market would be a really good place to go. Oh, thank you for saying so. Yeah, asking people permission really kills the mood. I feel much the same way as you. I desperately want to do more of it, but living in the suburbs I don’t get many opportunities, there aren’t enough people around outside and I would stick out like a sore thumb. Most of the pedestrian activity around me these days is inside malls and big-box and grocery stores, where photography is seriously frowned upon. But hopefully I can visit some downtown or touristy areas and special events again one day, and like you, gradually work my way from longer focal lengths to shorter ones. Also sometimes I do get up the courage to ask permission to take a portrait (a la Humans of New York, The Sartorialist, etc. ), which isn’t the same thing as street photography but is still fun in in its own way. Some of my favorite modern street photographers to follow are Eric Kim and Thomas Leuthard. I live in “the old suburbs” of Indianapolis where there aren’t sidewalks and the only people on the street are walking their dogs. Not much opportunity there. I haven’t really looked at much other street photography, just a random shot here and there. One or two of the photobloggers I follow get out and take street shots from time to time and that’s what has inspired me.